Eric Hughes has been called a “guaranteed crowd-pleaser” by Living Blues Magazine; his enthusiasm for Memphis music, and his authenticity, are obvious. Hughes was born and raised in Memphis and spent his weekends in Mississippi, where he came to cherish blues music. After a couple of years at Mississippi College, Hughes joined the Marines, and found himself stationed far from home. Hughes bought a guitar, hoping that learning some blues might ease his homesickness. That guitar did more than that. A decade of learning followed, traveling and learning from various bluesmen. 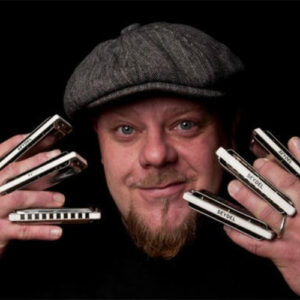 Eric first began performing in the clubs on Beale Street in 2001, where he continues to play several nights a week as a solo entertainer, with a duo, or in front of the Eric Hughes Band. Hughes was recently awarded a Muddy Mojo Award, won “Best Self-Produced CD” by Memphis Blues Society, and recorded the “Coolest Blues Song of 2013” by Big City Blues Magazine. Eric is joined by his brother Walter on guitar, bassist Leo Goff, and Brian Aylor on drums. Songs from Eric’s four CD releases continue to enjoy regular airplay on blues radio programs throughout the world.